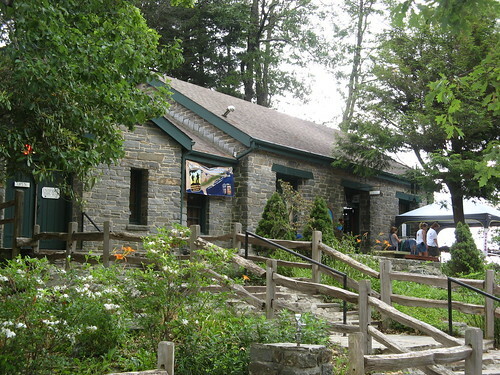 I combined an excellent Appalachian Trail loop with a pilgrimage to the famed Neels Gap/Mountain Crossings store and hostel last weekend. If you’ve ever gotten a Trail Journals jones, you’ve heard of Mountain Crossings: it’s where the outfitter’s staff patiently explains to physically busted, emotionally blasted thru-hikers how much happier they’ll be when they mail all their unnecessary crap home. 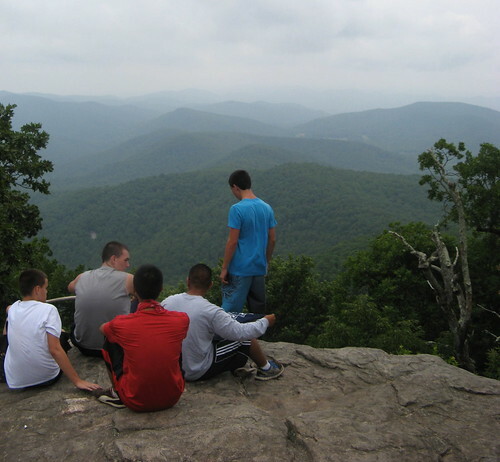 Most years about 9,000 pounds of excess baggage gets plucked from thu-hikers’ packs at Neels Gap. Neels Gap stands 30 miles north of the Appalachian Trail’s southern terminus at Springer Mountain Georgia, about three days out for the average thru-hiker. Picture the pitifully unprepared, painfully overloaded AT newbie on Day Three, suffering all the way to the top of Blood Mountain (highest point on the AT in Georgia) and entertaining glimmers of optimism at the two-mile descent to Neels Gap. “Heck, it’s all downhill from here,” they must be thinking. Then they start threading their way down the cartilage-crushing section of trail just below the Blood Mountain summit. “How can going down be so much harder than going up?” they grumble. They straggle into Neels Gap pondering the logistics of blasting their packs into space and imagining cab fare for 600 miles back to Toledo can’t be that expensive. My hike was not nearly so harrowing, but it had its moments. I thought I was hiking five miles; ended up hiking nine. Took enough water for three hours; had to make it last for six. Got off track within the first five minutes; started wandered aimlessly in the north Georgia woods within the first 10. Figured Neels Gap to Blood Mountain is only 1,100 feet of elevation gain. My GPS unit logged 2,200. I think there’s a famous saying along the lines of “adventure is just another word for poor planning.” But anyway. 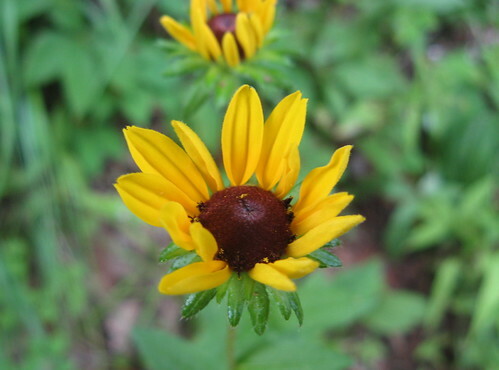 While Blood Mountain may be infamous to thru-hikers, it’s actually a fine day-hiking locale, if you’re up for a strenuous outing: awesome views, rugged and challenging trails, blooming wildflowers (in spring anyway). Hikers can’t park at Neels Gap unless they feel compelled to support local tow-truck entrepreneurs ($170 is the current fee). Instead, you have to park at the B.H. Reece Trailhead about a half-mile north of Neels Gap on U.S. 129. It’s a nice, paved lot with a signboard and a “you are here” map. The B.H. Reece Trail heads north for about three-quarters of a mile with 700 feet of elevation gain and intersects with the Appalachian Trail. From here you can either go left to Neels Gap, right to Blood Mountain or straight on the Freeman Trail, which intersects with the AT again after about 1.8 miles (from there you’d turn right for a more gradual ascent to Blood Mountain summit, though you’d be coming down the notorious knee-banging section to complete the loop). 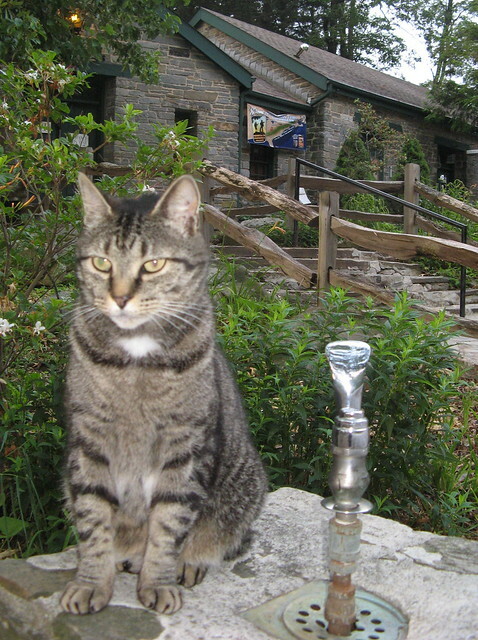 I went to Neels Gap first, a good idea if you need water, provisions or directions. If you’re fully geared up, though, it’s probably better kept in reserve as a reward for a hike well done (bearing in mind there’s still a 1.7-mile hike back to the parking lot). 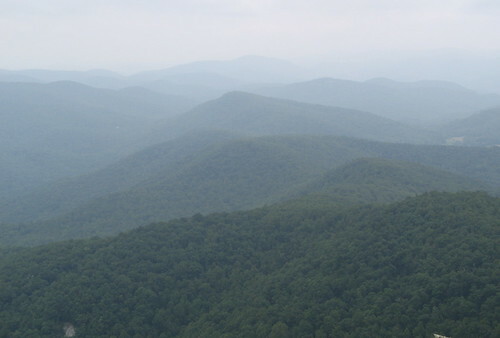 After checking out Mountain Crossings I headed back to Blood Mountain in earnest. It’s a seriously exhausting ascent, steep with lots of rocks and roots. Excellent views start opening up along the way up. 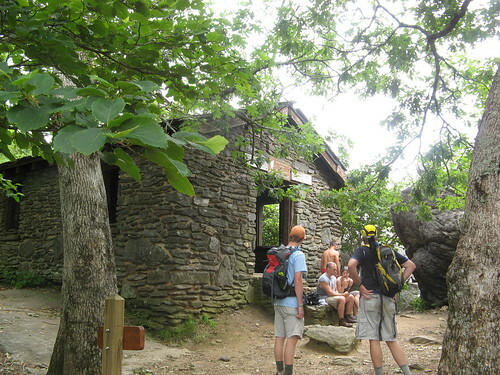 Eventually you reach the Blood Mountain Shelter, a way-cool old stone building. Scramble up the rocks nearby for a great overlook. From here I was grateful for a stretch of downhill trail. 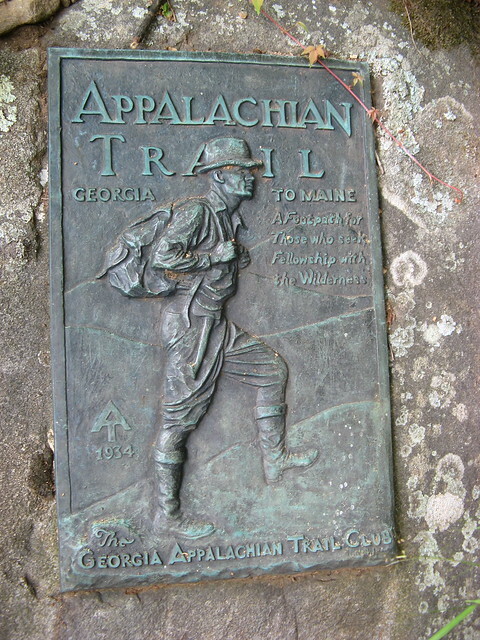 Eventually I reached the Freeman Trail, where I turned left and traversed Blood Mountain till I reached my previous point along the AT. 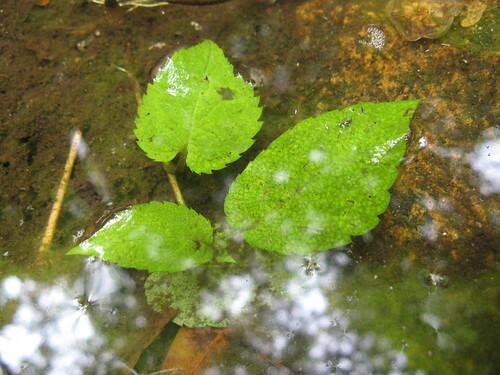 Leaf under water along the Freeman Trail. 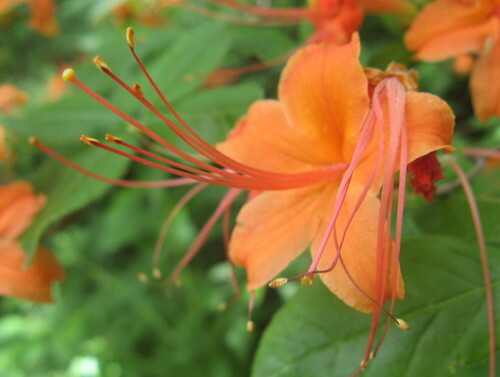 Lots of flame azaleas were in bloom, but I’m guessing the season’s about to fade. When I got back to the AT, I took the B.H. Reece Trail back to the parking lot. This is the part where I explain why I drove 250 miles to for a day-hike, passing countless wonderful trails along the way: I was hoping to drum up a little writing business for Verb Nerd Industries by pitching my wares to the folks at Mountain Crossings. They kindly put me up for the night at the hiker hostel, where I bunked with a small collection of section hikers. Like most AT hostels, the Mountain Crossings bunkhouse has seen better days (though for backpackers who’ve spent the past few nights sleeping on the ground it’s like a night at the Ritz), but it has a bunks with pads, a shower and an outfitter right next door. Not too shabby for $15 a night. The sign on Highway 129. 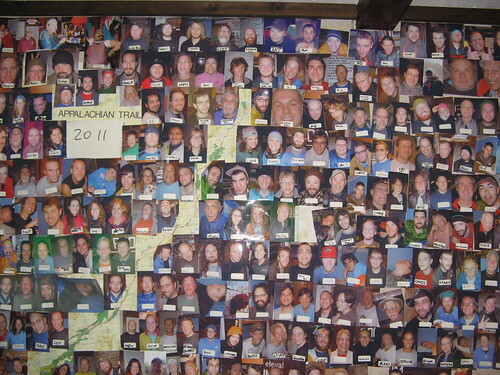 Pix of all the thru-hikers who’ve stayed there there this year. One of two resident cats. 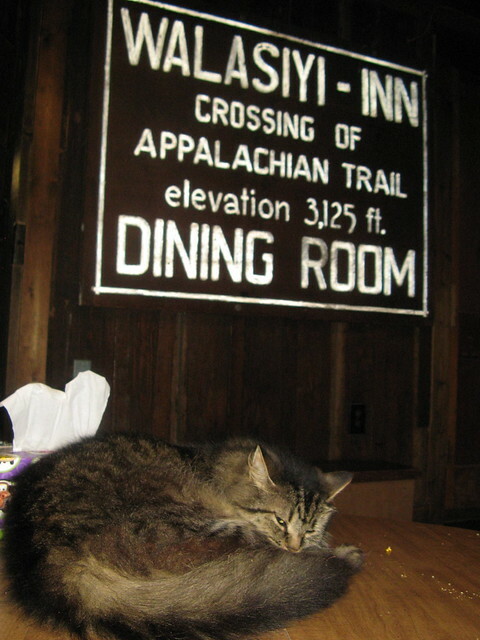 The other resident feline — very affectionate and prone to camping out on hikers’ laps. 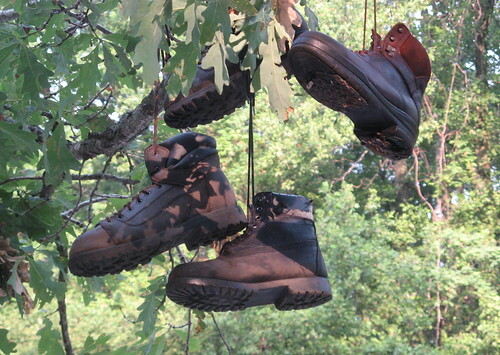 AT hikers often send their ravaged footwear to Mountain Crossings, where it’s deposited overhead throughout Neels Gap. 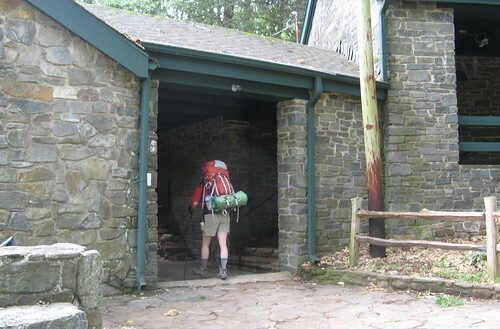 Here’s the section of the Appalachian Trail running under Mountain Crossings’ breezeway. Overall I’m seeing the benefits of hostel hiking after all the thru-hikers have come and gone. You can drive to much more remote trails than you’d do for a dayhike, and still have someplace to shack up without having to set up a campsite (it’s cheaper than many campgrounds). The amenities are spartan but what the heck, you’re out hiking already, getting all sweaty and grungy, so you’re not in much position to get all snooty. Those resident cats are adorable! And great photos! Sounds like you had a fantastic time. 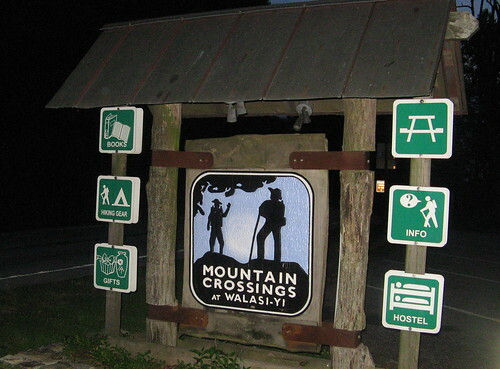 That Mountain Crossings store in Neels Gap was where I and many other thru-hikers bought our first ever crocs (2003). That was before crocs had become fashionable. I still wear the ones I bought there and remember that some hikers had actually hiked part of the A.T. in them. Tom, thanks for introducing me to a place I knew absolutely nothing about. You come through again. I enjoyed your write up – made me chuckle! Hell, what’s 250 miles anyway, when you used to live in California? enjoyed your info as my son just started thru-hiking the trail. gave me a good picture as to what he’s experiencing. thank you.